On August 21, 2013, Sean Boushie signed a sworn affidavit before a notary, and he swore that he and his wife were afraid of Bill Windsor. The false sworn affidavit was used to get William M. Windsor arrested and jailed for 134 days. “do not feel safe at home or at work." This is absolutely false as Sean Boushie published at least 38 comments in which he expresses no fear. Bill Windsor filed a police report. 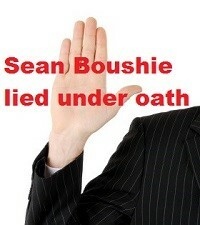 Sean B**shie made no complaint to the police. 3. Obtain University of Montana server logs for all posts listed above that were sent during work hours for Sean B**shie. 4. Require Google (Blogspot) and Joeyisalittlekid.blogspot.com to provide the IP addresses for every posting by John Smith and TinyFeetNHands, as well as the registration information. 5. Sean B**shie admits in Joeyisalittlekid.blogspot.com that he is both John Smith and TinyFeetNhands. Ask him. If he admits it, you have the evidence needed. If he denies it, prove he lied with the evidence from Google (Bligspot) and Joeyisalittlekid.